Once again an activist judge has disenfranchised the will of voters. This time in Utah, where voters in 2004 overwhelmingly voted to ban gay marriage, a radical judged cited the 14th Amendment as reason to usurp the ballot box to impose his own will upon the people of the Beehive State. Like in California before, the silly notion that VOTING should actually count for anything is a foreign notion to these radical judges. What is worse than their legislating from the bench is the hypocrisy of their reasoning. U.S. District Judge Robert J. Shelby declared in his ruling that the voter passed initiative declaring that marriage is defined as being between a man and a woman is unconstitutional based off of the 14th Amendment. My issue with using the 14th Amendment by radical judges is that they apply it unfairly, pushing forward their own liberal agenda while in the same breath denying it for the opposite political spectrum, namely matters concerning the 2nd Amendment. Let’s pick that apart real quick. The 14th Amendment basically states that all gun control enacted by individual states is unenforceable. Furthermore it states that any state that would try to infringe upon a persons 2nd Amendment rights is in the wrong as no state shall deprive a person of liberty. Finally, a state cannot deny any person within its jurisdiction the equal protection of the laws. The third part shouts out at me because isn’t that EXACTLY what states like New York have done with the SAFE Act? They pass the SAFE Act outlawing all of these types of firearms and magazines yet make SPECIAL EXCEPTIONS for police officers, both active and retired. If you follow Judge Shelby’s ruling stating that you cannot allow some people to marry but not others, how is it any different to allow SOME people to have high capacity magazines or sporting rifles and not others? The answer is: it isn’t. Judges like Shelby cannot have their cake and eat it too. They cannot be allowed to hypocritically apply the 14th Amendment to issues they are for while in the same breath deny the application on the 14th Amendment on issues they are against. 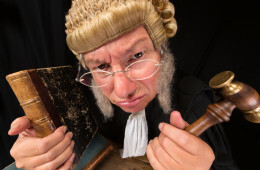 Judges can be a lot of things, but hypocritical is the one offense they cannot be allowed to indulge as it completely undermines the notion of precedent and fairness. Even without the SAFE Act, the fact that New York permit holders outside of New York City do not have their permits recognized in the City is a gross violation of the 14th as it does not give equal protection of the law throughout the state. The 14th Amendment must therefore also be levied as reason to outlaw (if not gun control entirely) May-Issue states; as every rejection of a permit without cause is a violation of due process. Based on Judge Shelby’s ruling logic California, Connecticut, Delaware, Hawaii, Maryland, Massachusetts, New Jersey, New York, and Rhode Island must all immediately become Shall Issue states lest they be in violation of the 14th Amendment. To look at the gay marriage case even further, two of the plaintiffs were married in Iowa but wanted their license to be recognized in Utah. By the logic in Shelby’s ruling, the floodgates to National Reciprocity have been opened. I want my PA License to Carry a Firearm (LTCF) to be recognized in every state. Why can’t I force every state to acknowledge my right to carry a firearm if the lesbian couple from Iowa can force the state of Utah to recognize their marriage license, regardless of what politicians and voters from Utah say? Shelby’s logic has basically said that I should be able to drive over to New York City with my .45 on my hip and give ole Mayor Bloomberg a high five on the subway with a grin on my face and a spring in my step and he has to stand there and take it. The gun on my hip if not the high five. If we are forcing states to recognize marriage licenses then there is no legitimate reason to not force them to recognize carry permits…no reason save raging hypocrisy. At the end of the day, if activist judges are going to legislate from the bench then they must accept the precedent that they set. Judge Shelby and those of his ilk who have overturned the will of the voters must also acknowledge that by using the 14th Amendment as an end around to usurp the legislative process to ensure what they view as a right, they must also apply it to actual rights. May Issue states, gun control laws that give preference to police officers and states refusing the recognition of another states CCW must be done away with because they are just a few examples of denying due process, liberty and equal protection of the laws. I choose to carry a gun.